Interview with long-standing Moxie champ Bob B.
November 16, 2009 11:10 AM Filed in: Interview: Bob B. 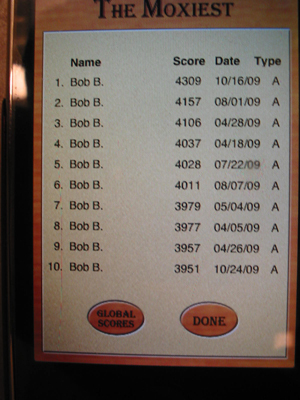 Regular Moxie players will recognize Bob B. since he has dominated the high score boards for many months. We caught up with him recently for an exclusive interview. Q: Hi Bob! What would you like to tell us about yourself? A: I live in Anchorage, Alaska, USA. I'm an engineer and I’m 42 years old. My hobbies include guitar playing and fishing. Q: How long have you been playing Moxie? A: I think I’ve been playing since March 2009. My wife bought it around that time, and I gave it a try and got hooked. Q: How often do you play Moxie? A: I probably play 5 or 6 times per week. I find it relaxing to play when I have spare time, like when I’m waiting for the kids after school. Q: Why do you like Moxie? A: I like Moxie for many of the reasons you mention on the webpage – it is strategic, can be played at a relaxed pace, the games only take a few minutes, and you can stop in the middle of a game if something comes up. There’s a degree of risk/reward and some luck involved at times. The other thing I like about Moxie is that I don’t feel like it’s a game that can be “beat”. There is always potential for higher scores, and a player can compete against themselves, or against the global community. Q: What other games do you like to play? A: I play Scrabble (same as the board game) on my iPhone, and either play against my wife, or against the computer. I don’t really care for the word games like Boggle. I do play some video games – I grew up with Atari, so I guess it’s in my blood. We play a lot of the Nintendo games. Q: What do you score in an average game? A: I don’t really pay much attention to average, because I’m trying for high scores, so these are guesses: For Animal it is probably 3000 – 3200, for Mineral, it is probably about 2600 – 2700, and for Vegetable, it is probably 2400. Q: Do you have any friends who play Moxie? A: Surprisingly, not many of my friends have iPhones, so I don’t know anyone that plays it, besides my wife. She plays occasionally. Q: Do you prefer to play "Animal" "Vegetable" or "Mineral"? A: It’s a toss up between Animal and Mineral. I play all three lists, each has it own challenges. Q: Considering that you play all 3 lists, what do you think the potential high score is for each of the lists? A: I’m certain someone will top 4500 in Animal some day. With a couple of breaks, my top two scores could have reached that, and a couple other players have put up big scores. For Mineral, I see a lot of room for potential – I think 4000 is reachable; I’d like to see more people playing it. For Vegetable, I’ve had a hard time figuring out a way to make a big score, but 3500 is a good milestone that should be reachable. Q: We know you probably don't want to reveal all of your secrets, but can you share any strategies or hints for folks who want to improve their game? A: You’re right, I don’t want to give everything away, but here are a few thoughts. In general, using the Moxie words will help with improving scores, but not at the expense of wasting four or five turns to get a Moxie word. I’d suggest picking a strategy and sticking to it – look for a strategy that allows you to make points on every turn – you can get 7 or 8 Moxie words and not get a great score. Don’t be afraid of taking the occasional Twaddle if it leads to a potential to make more words with a different letter combination. I suspect that the people who are scoring close to or over 4000 on Animal are doing something very similar to what I do. Bob, thank you for the great interview!